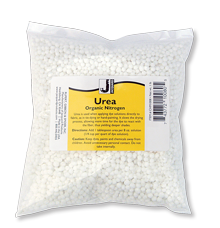 Urea is a humectant that attracts moisture from the air. Urea is used when applying dye solutions directly to fabric, as in tie dyeing or hand painting. It slows the drying process; therefore it allows more time for the dye to react with the fiber and yields deeper shades. Urea is used when using Procion MX dye with the squeeze bottle method. There are about 1 1/2 cups of urea per pound. Use 1-2 Tablespoons per 8oz of dye mixture.